It's a WIP Wednesday kind of day! For those of you who don't know what WIP is, it's work in progress. And for me, that's a bunch of things, some with pictures, some without. First WIP is an English paper piecing project I started yesterday. My guild holds a skill class once a month, taught by members. It's a great way to learn something new, and a wonderful way for members to meet and share. Yesterday was this project, and when the second set (in the back) gets sewn just like the first, the two will be put back to back to make a coaster. I've never done English paper piecing, so this was a great introduction. It's definitely not hard, just time consuming due to the hand work. But makes a nice project to do while traveling or waiting. Would I do more? Not sure. Next WIP is my scrap blue flowers. I started quilting this on Friday, got nothing done over the weekend, and come Monday, decided I didn't like what was going in the border. So, I spent that night and some of yesterday doodling, finally pulling out the clear vinyl overlay and drawing on that. After several ideas, I've settled on one, so today I'll try to finish it up. Hope it goes well, as I'm being rather picky on this quilt. I'm even tying the threads and burying them! I always get judge's comments about my usual tie offs leaving knots on the back, and I'm trying not to do that on this one. And the last WIP is the batik nickels for the August Book of the Month. Haven't done a darn thing! But there is good news. In front of me is my list of unfinished projects (click here for that), and I'm happy to report that four items are crossed off the list! Unfortunately, they may have been replaced with four more. I don't really want to think about that right now--I need to focus on the list as is. That's it for WIP's. I would like to thank everyone for all the lovely comments about Fred the Fugitive and my Metro Rings Medallion. I try to personally respond to those leaving comments, but some of you I cannot contact. Usually, it's because the comment is from a no-reply-blogger, and the others, who knows? But for all of you whom I have not responded back to, I just want to say thank you! All comments are greatly appreciated! 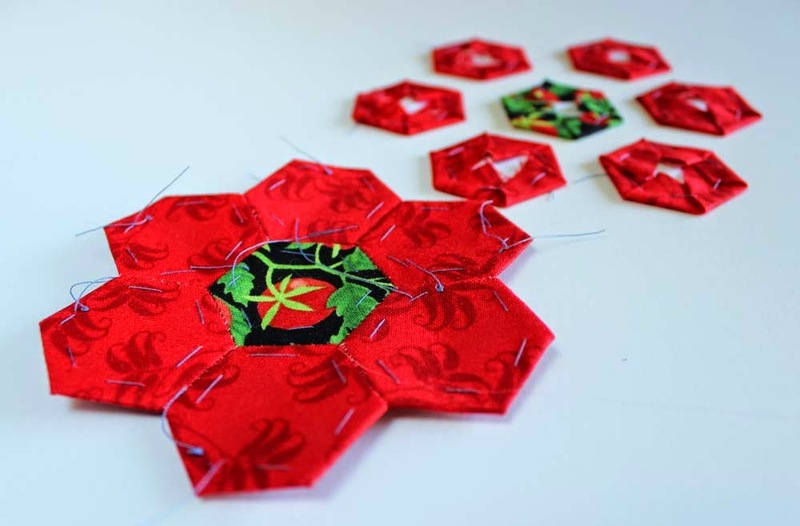 Linking up with WIP Wednesday at Freshly Pieced, and Let's Bee Social at Sew Fresh Quilts. WE are alike in getting comments from judges about visible starts and stops. So I too have started knotting and pulling threads at every start and stop. I just finished a queen top where I did that through the whole thing. I put a little sticky magnet on the front of my machine and keep my needle right there. I got those needles that are open at the end so you can pop the thread in without having to thread in the normal way. I found a neat spiral-eyed needle that threads really quickly. I'm happy to hear someone's honest opinion on English Paper Piecing. I've been dying to try it out but would have to learn via online tutorials. Love those scrap blue flowers! I think I would do it again if it were a small project with no time constraints. It might be fun to just have a travel project with no real objective in mind, but maybe after 9-12 little flowers, they could be appliqued to a block for a small quilt. 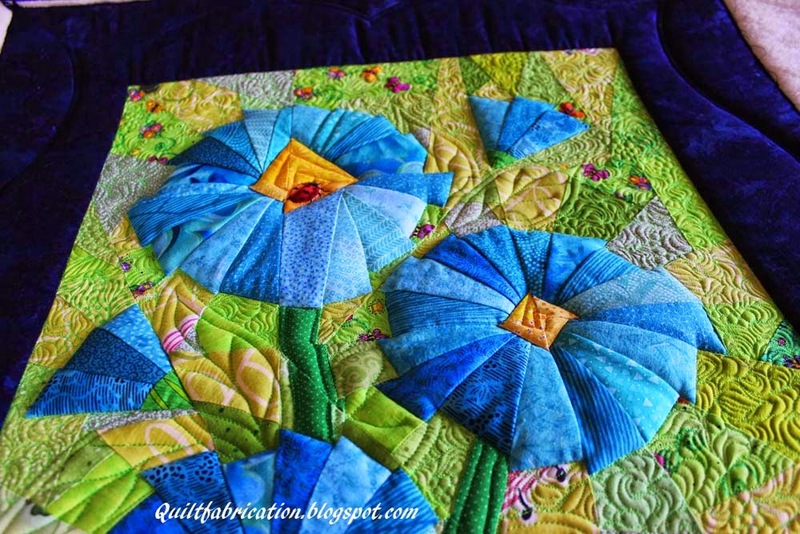 Your scrap blue flowers is one of the best quilts I have seen online in awhile. It is a beautiful top but the quilting is really making it come alive. How fun! Your hexies look great, Susan. And that scrappy blue flower piece is incredible! Love the quilting. 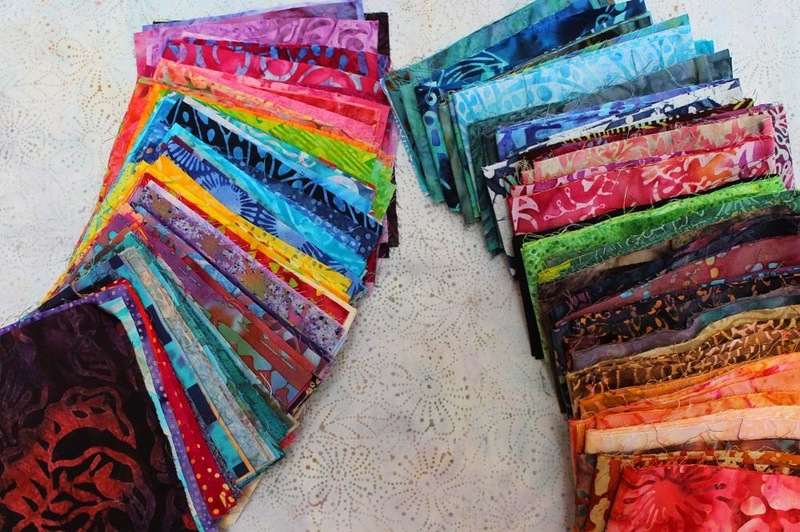 Can't wait to see your progress with that gorgeous fabric pull!